Every building and household utilizes openings at numerous positions in and around the building: sliding and swing doors, garage doors, sun-blinds and automated gates. When automated, these doors are equipped with systems that are able to manage the opening action, avoid unintentional opening, control the speed and torque, detect the presence of objects along the path, and a number of other functions. Automatic opening systems incorporate smart sensors, motor controls, supplies and battery management, which help to reduce energy losses in all conditions. This is where Infineon comes into place. 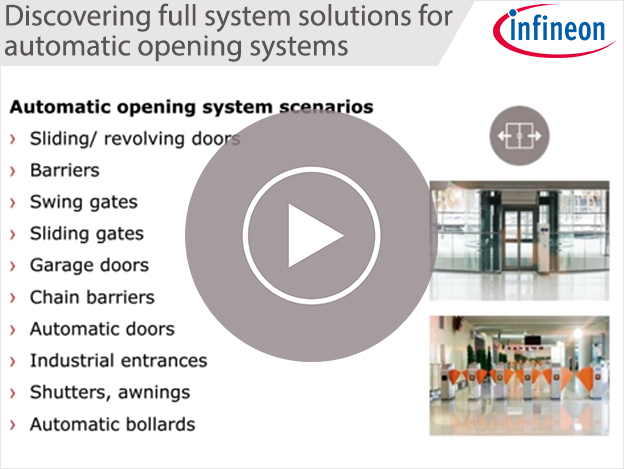 We'd like to invite you to on-demand webinar "Discovering full system solutions for automatic opening systems". Infineon's full system solution for automatic opening systems is presented with focus on the motor control and power management solutions. Join the 60 minutes webinar and learn more about our recommendations. After registration you will receive a confirmation email with a link to the webinar.